Title text: Disappointed that they caved to fan pressure and went with Ruth Bader Ginsburg over Elena Kagan. In my ignorance, I had to Google this title, and I learned of other playable characters. Is it wrong of me to wish to congratulate Sonic The Hedgehog for having made a new life for himself after having been forced to become a stateless refugee? Each California senator represents nearly 19.8 million people, over 68 times as many as the 290,000 each Wyoming senator represents. The Senate puts House Gerrymandering to shame. If the smash vote was gerrymandered, then there would be a lot more news about the lack of fairness in the Coke Santa vs Pepsi Dudes seat. Headcanon: Mavis Beacon is the hand boss. "Lot's wife -- brings the salt!" I wonder how much I would need to pay Nintendo to get myself added to Smash Bros.
Last edited by Quizatzhaderac on Wed Nov 07, 2018 5:48 pm UTC, edited 1 time in total. vodka.cobra wrote: Headcanon: Mavis Beacon is the hand boss. I definitely spent way more time on Mavis Beacon Typing Tutor than any of the main Platformers/etc out there. By choice, i.e. just for fun. Which probably says something about me. Why is there discussion of gerrymandering in this thread? Did I miss a layer of the comic? Pfhorrest wrote: Why is there discussion of gerrymandering in this thread? Did I miss a layer of the comic? cellocgw posted in the wrong thread? Clearly, any strangely-shaped districts in Super Smash Brothers should be considered charmandering. Why is Waluigi not at the top of Randall's wishlist? There's been outcry over his absence since summer. I was obsessing with the fact that Randall put, presumably as an obituary, Beto into his list. BAhAHHAHAHa, no no, nothing to do with that tale. I was going for a much worse reference. Older, too. That's the joke implied with the first entry. I almost have to think they are going to put him in as a surprise at this point just because of the memes. I always thought it had something to do with "shielding" a system against random encroachments that could not be subsequently removed easily via uninstalling. The threat of badly-written applications that wouldn't clean up after themselves when you were done with them probably sold a whole lot of software back in the day. Which is a bit curious, considering those were the days when a lot of software toys would just politely run out of the directory you'd shove them in. No shell integration, no registry keys, no autorun, just make a shortcut and run on command. 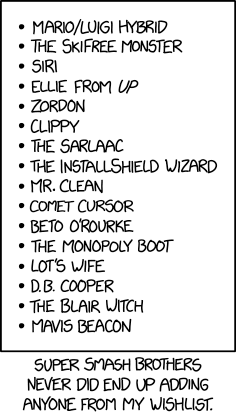 I'm also a bit surprised Randal didn't go with the WISE installation wizard -- a somewhat older device that had the silly side-effect of making removing software using the bundled uninstaller look like a bad idea regardless of what it was, by naming the thing unwise.exe. Technically, yes, InstallShielded software would note changes made (like file (re)associations) so that on uninstalling using any suitably complimentary removal method would revert things to how they were before. Although it often didn't go perfectly. Install two graphics-editing softwares in a row, each (automatically or, ideally, by getting the user to agree as part of the installation) took 'charge' of various graphic formats and then uninstall the former and sometimes it would revert nothing (as no longer ".JPG opens with being-deleted-program", because instead you have ".JPG opens with successor-program") and sometimes it would send the file associations were reverted to the original state prior to both installs (windows default image editor, if any), losing the successor program its (or a smattering of its) associations. If it did the (safer) former thing, then there was a chance that Uninstall(Wizard)ing the successor program then set the associations to the non-existent first-to-be-removed program, rather than back to the Windows default (or the post-default, pre-these-other-two application that it should by rights have fallen back to, if it's still there). Hard to program properly, given every app potentially and even likely had a different mindsets behind the Install behaviour (from the opposing options and philosophies able to be followed). I think that's why I quite like the additions of "Open with <&foo>" to the right-click menu when you install <foo> (whether or not the default Open gets retasked straight to <foo> as well), as a basis for continuity. It's been improved, since the heady days of Win 9x when this became 'a thing'. But I'm sure I've seen enough new problems arise in later Windows versions to make two decades of 'improvements' and refinement somewhat moot for anybody who cares enough about it and yet can't easily prepare to resolve such issues by hand-reassociating things. Comparatively, the keeping/removing of shared-DLLs tended to be dealt with satisfactorily enough. Though I still preferred the stand-alone all-inclusive executable (or, if necessary, relatively-local-to-executable .dll supplements) that would run from whatever directory you wished to place it for full portability. Not so much that I preferred the proliferation of C:\FOO_PROGRAM root-located directories by default, rather than something FOOish beneath the "C:\Program Files" or otherwise apportioned %ProgramFiles% location, but you still knew where you were! On a Mac, I automatically distrust any software that insists on being "installed", because there's no need for it in almost all cases and so it makes me wonder where the heck this installer is mucking about with what besides just putting the app in the applications folder (which in turn isn't even a necessary step; it should run fine wherever the hell I want to put it, and if it doesn't someone did something wrong). SuicideJunkie wrote: That's not gerrymandering? leeharveyosmond wrote: In my ignorance, I had to Google this title, and I learned of other playable characters. 71 characters is ridiculous. And so many obscure characters, it's like they were picked at random. Early versions' odd-ball characters like Captain Falcon and Mr. Game and Watch were fun and quirky, but it can go too far. Granted some of the characters just re-skins with only very subtle or no change in character movement, but it's still nuts. Considering too that SSB has a competitive play element [or at least it did] it's going to be impossible for the developers to balance that many characters. Once this is released into the wild, rest assured, players will find all the exploits, glitches, and over- and under-powered moves/characters play-testing missed. When Captian Falcon was put in the original SSB it made sense because a decade had not passed since the last F Zero release. It is like Chrono Trigger at this point. P.S. Who wishes that Nintendo made a program to turn arbitrary images into maps and then added gerrymandered districts Pokefloats style with the probability of a district showing up was proportional to the population? Doing the same thing with collected trophies would be nice too. jewish_scientist wrote: When Captian Falcon was put in the original SSB it made sense because a decade had not passed since the last F Zero release. It is like Chrono Trigger at this point. Yeah I guess, but F-Zero's best attribute was being released at the same time the SNES console was released. Otherwise F-Zero was a very mediocre game that lined used game bins. Maybe he was popular in Japan... but my friends and I had nearly forgotten F-Zero existed until Captain Falcon appeared in Super Smash Bros.
That said, Captain Falcon was my favorite SSB character to play as... jumping into the fray and landing a Falcon punch on 3 of my friends at the same time was always a highlight. Ranbot wrote: Considering too that SSB has a competitive play element [or at least it did] it's going to be impossible for the developers to balance that many characters. Once this is released into the wild, rest assured, players will find all the exploits, glitches, and over- and under-powered moves/characters play-testing missed. At least they can release patches now – and they certainly will. Considering it's been four years now since the last iteration was initially released, they're hardly starting from scratch. 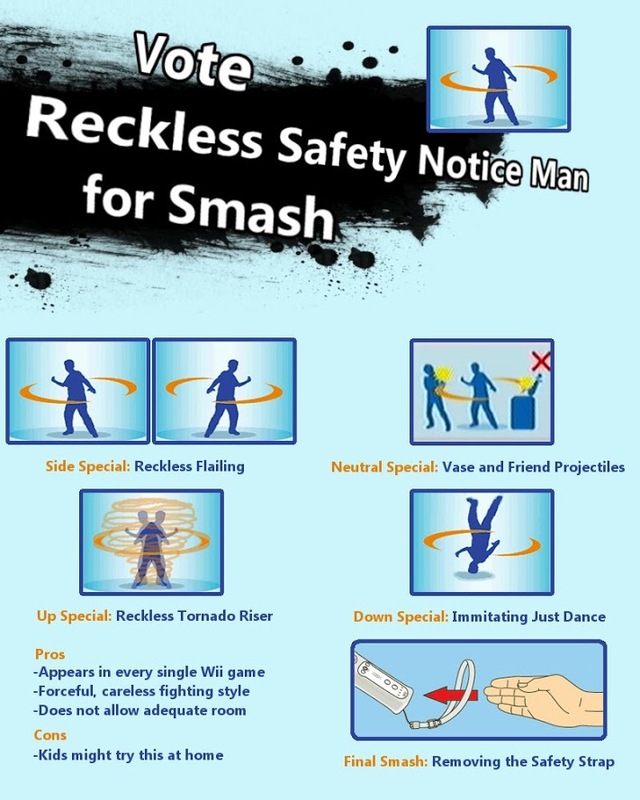 It's a fun party game with Final Smashes and items and so on, but I have long abandoned any hope of playing Smash competitively. That stuff gets scary, or at least the vids I've seen make it seem that way. Maybe he was popular in Japan... but my friends and I had nearly forgotten F-Zero existed until Captain Falcon appeared in Super Smash Bros.
You'd think a guy who drives a car all day wouldn't be so disproportionately buff. Maybe he’s driving without power steering? By the normal definition of gerrymandering, that's not really the same thing, as State boundaries weren't drawn with the specific intent of manipulating who would win how many of the state elections. That doesn't mean the way Senate representation works is desirable though. Incidentally, I read that people usually pronounce gerrymandering wrong, as it is named after a politician named Gerry, who was responsible for that oddly shaped district in 1812 someone posted, and his name was pronounced with a hard "G" sound, like in "goat", not a soft one like is often written as a "j" instead. In more of the original topic, other than his appearances in Smash and an F-Zero themed Mario Kart track, the most recent F-Zero game was one of the 12 games that made up the 2012 Wii U game Nintendo Land. That reminds me, how have there been so many Mario Karts and no F-Zeros? My guess is that every time Nintendo wants to make a racing game the choose the safer option, which creates a feedback loop where no F-Zero games come out because no F-Zero games have come out recently. Also, I'd say Mario Kart has better characters, even if the game you're playing doesn't develop them. But yes, I miss the feeling of making of right angle turn at 500 kph; I may dust of my wii tonight (gigidy).